The new View 24G is equipped with two slideouts: including one containing the dinette on the street side. Traditional touches combine with fresh features to further the appeal of this popular Type C motorhome, the Winnebago View 24g. The Winnebago View has been a staple Type C motorhome, enjoyed by many RV enthusiasts since its 2006 debut. 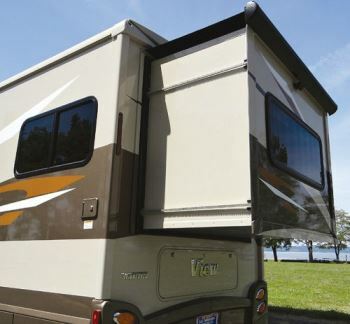 Since then, Winnebago Industries has placed almost 5,500 View units into the hands of happy campers, along with another 4,000-plus Navion coaches. 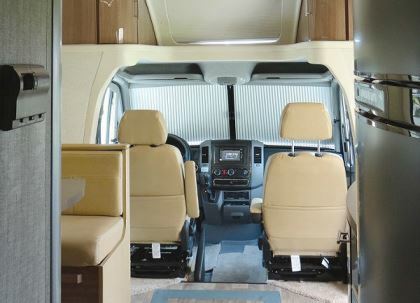 (The Navion originally hailed from Winnebago’s Itasca product line, built on the same Sprinter chassis and offering the same floor plans as the View.) Winnebago, by the way, is the largest producer of Sprinter-based motorhomes in the world, responsible for almost 50 percent of all coaches in North America built on that platform. The View tradition continues with the release of the new 24G floor plan. The standout feature of the 2017 View 24G is its rear-mounted, deep bedroom slideout (more on this later). 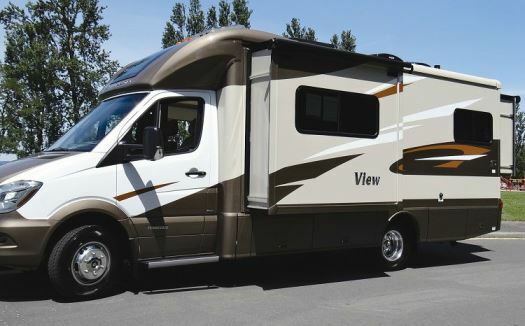 The View is available with either a conventional cab-over sleeping berth or a shortened, sleek front cap containing extra storage and a very cool viewing window/skylight (as reviewed). I had the pleasure of road testing this new model on a glorious, blue-skied day in the Pacific Northwest near Puget Sound. This model is housed on the respected Mercedes-Benz Sprinter chassis. Its 3.0-liter 188-horsepower turbo-diesel power plant provides ample torque to the drive axle through the five-speed, tip-shift transmission. As a result, the test coach traveled effortlessly along country back roads as well as on the freeway. Having tested many motorhomes with this same platform, I found the View’s acceleration and braking maneuvers to be as expected. The steer axle tires stayed straight and true through a series of panic-stop tests with hands off the wheel. Void of cargo, the coach sailed up inclines effortlessly. I only wished for a more mountainous terrain to see how it would climb longer, taller hills. With an occupant and cargo carrying capacity (OCCC) of 1,272 pounds, this coach should have few problems, if any, traversing anywhere in the country, even fully loaded. Just left of the forward-mounted entry door is the first of many storage bays. A Xantrex Pro 1,000-watt inverter is conveniently mounted to the ceiling of this compartment, well out of the way of any stored goods. Farther back on the passenger side, just rear of the drive axle, sits the 3.6-kilowatt Cummins Onan propane-fired generator. If buyers are so inclined, they can choose the optional 3.2-kw Onan diesel-fired generator. The final right rear compartment is yet another generous bay ready to hold camping and travel gear. Careful thought must be given when stowing cargo on the curb side of the coach, however, as all four propane-burning appliances are mounted there, along with the generator. Thankfully, the 24G comes equipped with a Truma AquaGo tankless water heater, a recirculating water system that provides instant hot water at all faucets (no wasting the water in the lines); with no tank, there’s no need to fret about extra weight in the hot water department. Plus, plenty of storage space on the driver’s side can help balance out the cargo. Though I can appreciate a cleaner roofline, I was a bit taken aback to see two side-mounted vents for the absorption refrigerator instead of one lower vent on the side and a top-mounted vent on the roof. Optimum heat extraction from behind an absorption refrigerator occurs when a vertical chimney exits through the roof. Typically, twin side vents are necessary only when the refrigerator is mounted in a slideout. The addition of the new bedroom slideout extending rearward does mandate operator attention when backing into campsites. Most of us, by now, are well aware of the side-to-side clearances concerning slideout movement, but care also must be taken with the 24G while backing in. Don’t park too close to that tree or fence! Exterior access to yet more storage space lies beneath the queen-size bed, right below the slideout. On the street side of the coach, the fresh-water gravity-fill door is mounted just below the bedroom window. A city water quick-fill tank valve is in the plumbing bay directly below. The 30-amp shore power cord also shares space inside this left rear compartment. The 24G is not equipped with an automatic transfer switch to enable the generator to power the coach. So, the shore cord must be plugged into a generator output receptacle within this space as well. Certainly not a deal breaker, but I believe most buyers would appreciate an automatic transfer switch instead, at least as an option. Dealers, however, would be happy to install one as an aftermarket add-on. As such, users must remember that in order to power the coach with 120-volt-AC electrical service, the shore cord must be manually plugged in somewhere, either into the campground pedestal or this generator receptacle. Coax input connections for a satellite antenna and park cable television round out this compartment space. 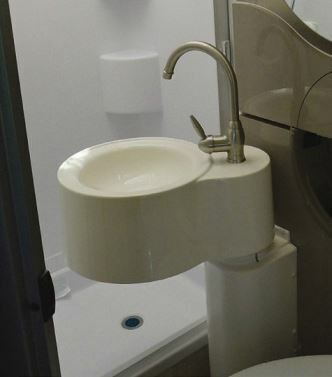 In addition to the city water connection, the lighted plumbing bay is outfitted with all the expected necessities, including a winterizing bypass valve, hot and cold shower hose faucets, a water pump switch, both holding tank termination valve pulls, and valves for the hot and cold low point drains. The termination assembly for connecting the sewer hose is mounted outside of this compartment below the sidewall, while the hose connection for the black tank rinser is installed on the sidewall above the compartment. Since the underbelly is totally exposed, our subject coach was further equipped with the optional holding tank heaters — a must for users accustomed to winter RV travel. Just ahead of the rear axle and mounted below the dinette slideout on the driver’s side of the 24G, two storage compartment doors open to a long, single storage bay. All baggage doors are lockable and conveniently supported by gas shocks. A sewer hose stowage tube is also accessible when the rear compartment door is opened — a nice touch, as the tube for the hose will prevent sewer odors from permeating this bay. Forwardmost on the driver’s side, just aft of the Sprinter driver’s door, is a narrow compartment opening for the remote propane fill valve. The ASME propane tank itself is installed amidships. From a service perspective, a technician would not have an easy time accessing the pressure regulator mounted behind the panel containing the remote valve, emergency solenoid switch, and 20 percent outage valve. The typical coach owner probably will not attempt this, so this should be a nonissue. The 24G is further equipped with an automatic, legless patio awning that has an LED light strip installed in the roller tube. I’ve always been a sucker for a nice, quiet afternoon under a patio awning! Especially with a year-round view of the snowcapped mountains on the Olympic Peninsula across Puget Sound! The auxiliary battery bank (two Group 24 deep-cycle NAPA batteries) is mounted in the typical location within the entry step well. A recessed portion inside the step well also contains electrical controls for the powered awning, its light bar, the Lippert Kwikee electric step, and the chassis battery disconnect solenoid. At the entry door, I was disappointed by the existence of a large gap between the bottom step and the door threshold. It appeared that the step tread and rubber mat were cut too short and failed to reach the inside edge of the threshold extrusion. The result was a deep gap that had trapped an assortment of debris: insulation remnants, sawdust, and randomly dropped screws. I’m hopeful this was simply a one-off mistake during production of this particular coach. However, my disenchantment soon dissipated upon entering the welcoming, well-designed, Euro-influenced interior. The 24G is the only View floor plan equipped with two slideouts. The first is across from the entry door, where the convertible dinette is mounted directly behind the driver’s seat in its own dedicated slideout. A Flexsteel couch and table are offered as an option in this space. Three curved-surface cabinets are mounted at the ceiling above the dinette. Directly to the rear of the dinette ensemble, a beautifully crafted curved door introduces the lavatory. 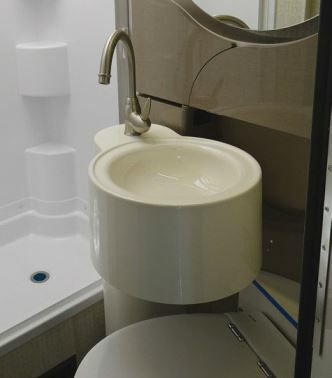 The lavatory itself holds an interesting feature: a swivel sink assembly that is positioned inside the shower stall for access to the toilet. It swivels out and over the toilet when one is using the shower or just the sink. This is an ingenious design, perfectly suited to a relatively short Type C motorhome. The toilet is a Tecma Silence Plus macerator model. Above the toilet is a nifty fold-down access panel for added storage space, in addition to a mirrored medicine cabinet. A self-cleaning, retractable shower screen isolates the shower stall inside the bathroom when the shower is in use. Opposite the dinette on the passenger side of the coach is the small but utilitarian galley, replete with all the necessities we’ve come to expect in a motorhome. It features stylized curved cabinets, which accent the View’s sleek interior design. Three deep drawers are mounted directly below the two-burner cooktop, next to the main galley cabinet. A double sink with a longneck faucet spout shares the same counter space, while ceiling cabinets house the television and convection-microwave oven. The main 28-inch HD television is hinged. Tucked behind it is the stereo system, featuring an AM-FM radio with a weather band, a CD-DVD player with Bluetooth technology, satellite and antenna coax connections, plus 120-volt-AC and USB receptacles. A storage shelf in this nook hides even more cargo or supplies. Also in the galley, the 24G features a two-door Norcold absorption refrigerator. Above the fridge, another cabinet serves as the pantry, while the main electrical cabinet is situated right next to it above the wardrobe closet. Mounted in one corner of this electrical cabinet are the solar charge controller (for the optional 100-watt panel on our review coach), the monitor panel for tank levels, the generator start/stop switch, plus the water pump and water heater switches. A Xantrex control panel for the inverter, both slideout switches, the power switch for the aforementioned holding tank heaters, and a remote emergency solenoid switch for the propane container are installed in the other corner, all at eye-level. Perfect! As mentioned earlier, the main feature of the 24G, in my estimation, is the rear slideout in the bedroom, which extends straight out the back of the coach and encompasses the queen bed. When this 36-inch slideout is extended, the room becomes much larger than expected in a 24-foot motorhome, even with minimal bedroom accoutrements. With the emergency escape window positioned directly above the bed, occupants have the ability to evacuate, if necessary, without even getting out of bed — a feature that will not be overlooked by safety-conscious RVers. A hinged section enables the memory-foam mattress to conveniently fold when returning the slideout to its travel position. Above the bed are two cabinets that continue the curved laminate theme found elsewhere throughout the coach. Two LED reading lamps are mounted underneath the cabinets. For ambience, an additional LED light strip, featuring two brightness modes, is installed in the bedroom ceiling. Instead of nightstands, a small shelf is mounted on each side of the bed. Our subject coach included the optional bedroom television, which is mounted at the ceiling next to the wardrobe closet on the passenger side. The 45-amp AC-DC power center is installed directly below the bed for easy access regardless of whether the bedroom slideout is extended or retracted. A simulated wood vinyl floor covers the majority of the 24G; the bedroom is carpeted. The tinted window treatments include MCD solar blackout roller shades or mini blinds (in the galley). Skylights also are equipped with retractable shades, as are the cab door windows and even the windshield. The pleated cab shades integrate unique attaching and stowing methods; they store in the cab window trim, as opposed to removable blinds or wraparound curtains. All interior lighting utilizes LED technology. Soft vinyl material covers the ceiling. The review coach was equipped with a 15,000-Btu ducted roof air conditioner and a 20,000-Btu forced-air furnace. As previously mentioned, hot water is produced by a tankless heater. An amplified HDTV antenna sits on the roof along with a powered exhaust vent in the bathroom. The north end of the coach is typical Mercedes-Benz Sprinter, with the exception of the previously mentioned pleated privacy shades that cover the glass up front plus the windows in the driver’s and copilot’s doors. The pleated shades even covered the small “wing” windows, with a silhouette that matched the slanted window dimensions. This particular 24G was equipped with the shortened SmartSpace overhead section, which incorporates sleek, curved laminated cabinets on either side of what I deemed a viewing window or quasi-skylight. This window also was equipped with a pull-down pleated shade. When opened on the day I took the motorhome out, it provided a gorgeous view. As an option, buyers can instead choose a traditional cab-over bed, accessed by a ladder. Personally, I would opt for the extra cabinet space and viewing window, since most couples I’ve encountered have said that they rarely use that extra sleeping berth, except for the occasional guest. Other cab conveniences include powered windows, door locks, and mirrors. The powered mirrors also are equipped with defrost heaters and turn signals. The pilot and copilot seats have adjustable lumbar supports; both chairs slide, recline, and swivel to face the living area. On the dash, a 6-inch touch-screen monitor controls the audio system and the rearview camera. The test unit was outfitted with the Honeycomb interior décor, high-gloss Marbella cabinetry, and Copper Canyon exterior paint with deluxe graphics. It was further equipped with an optional infotainment center and GPS, an air conditioner heat strip, and cab seat lounge cushions. The coach contained 53 cubic feet of exterior storage space, more than any other View model. The fit and finish of our review unit probably could have been given a little more attention to detail. For example, I found 12-volt-DC control wires hanging inside interior cabinets that possibly could get tangled with stowed gear; exterior storage bay sealants that could have been applied in a more careful manner; and the previously mentioned gap between the entry door threshold and bottom step. Most of these probably would be corrected during a typical dealer predelivery inspection prior to handing the keys over to the buyer. Overall, I do feel the 2017 View 24G is an inspirational new floor plan, utilizing unique features and coupled with a clean, sleek, European influence that brings a freshness to the line. So indeed, the tradition continues. The retail price as equipped and tested is $133,689. For more information regarding the entire Winnebago View line, visit www.winnebagoind.com/products/class-c/2016/view/overview.